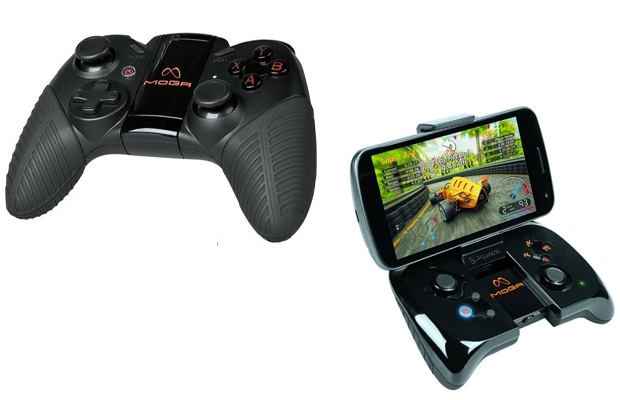 Last winter, PowerA set the bar for mobile gaming accessories when it introduced a contraption capable of playing Android games without the need of resorting to the touchscreen: the MOGA pocket controller. Small, portable, and most importantly, functional, the MOGA was considered a huge success for the accessories brand. And while embraced by the gaming community, several players weren’t sold on it and seeked a controller that looked and felt similar to those found on current gaming consoles. The company took notice and went to work on its second-gen controller, welcoming the MOGA Pro Controller to the soiree. Expanding on the pocket version’s capabilities, this specific model is an embodiment of what a mobile gaming controller should be. Now that gamers have the controller they’ve been yearning for, the question is whether the Pro has enough to outshine its impressive predecessor? What we do think? Tap into our review. With a revamped design and advanced control layout, the Pro resembles the standard Xbox controller minus the heavy G-factor. The rubberized handgrips give it a durable presence. It’s also wireless and rechargeable, therefore you can utilize it when playing games on a tablet or mirroring gaming content on an HD TV via HDMI port. The MOGA Pivot also works with the Pro. We mention this because it’s basically a hub where gamers can sync the controller to compatible titles. And we’re talking titles that deliver the graphics and gameplay of some current generation games like Grand Theft Auto: Vice City, Shawdowgun: DeadZone, and The Conduit HD. While neither are on the level of a Halo 4 or even Grand Theft Auto 4, it’s an impressive library that all console-based gamers can appreciate. The performance on this thing was amazing. Playing first-person shooters like Dead Trigger left me with the impression I was playing on a console. Now the only thing that requires getting used to is the dual-analog setup, as the two sticks seem to be placed further away from each other than we’re normally accustomed to on the Xbox 360 and PS3 gamepads. For a Bluetooth-enabled controller, button tactility was on-point and showed no signs lag or freezing when playing titles. The differences between the two are not only in size, but button layout as well. The original MOGA featured flattened buttons and was more compact and fit snuggly in any pocket, serving as the ideal portable gaming controller. On the other side, the Pro features the more traditional controller scheme with oval buttons, analog sticks, and firm-grip handles, which makes it more comfortable to use. Not saying the first-gen model wasn’t easy to manage, but it took some adapting to at first. Unfortunately for the Pro, we found its size to be a problem. When opened up, the pocket version is the same size as the Nintendo 3DS and is easier to lug around. In fact, I used to carry it so much to the point where I used it more than any other handheld system. The Pro isn’t pocket-friendly, especially if you’re attaching something like a Galaxy Note II onto it. We actually tried the combo and noticed the device constantly falling back due to the heavyweight load. I personally don’t feel comfortable breaking it out in a Starbucks or any other public place. You might want to keep it handy when chilling at home or on a long plane ride. From its feel to the improved design, the MOGA Pro is a great upgrade from the original controller. Playing games like Muffin Knight, Real Boxing,, and Vice City on an Android smartphone or tablet has never felt so natural. Sure, the portability factor has been diminished a little. It’s still a peripheral you can easily toss in the backpack or jacket sleeve and play with on the go depending on the location. 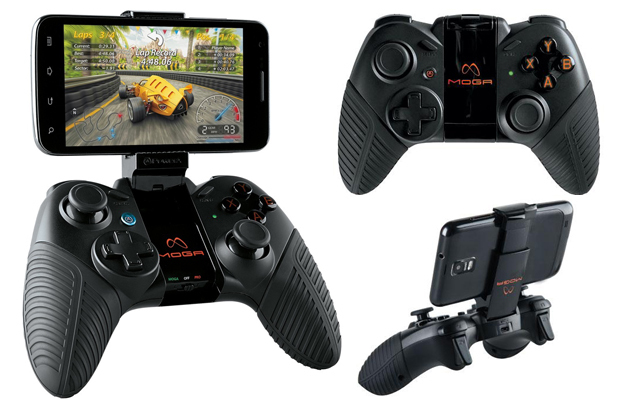 Some gamers remain on the fence about purchasing a MOGA device, but when taking into account the expanding lineup of compatible games and solid build of the controller, the Pro bears all the essentials necessary to enhance your mobile gaming experience.